Few Scots ate desserts and cakes before the 1800s. Save for the sweetmeats and delicacies eaten by the élite at the end of a meal, sweet foods were virtually unknown in the Middle Ages. With the opening up of the New World from the mid-17th century, sugar began to be shipped in bulk from the West Indies for large-scale refining in Glasgow and elsewhere on the River Clyde. 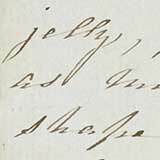 Soon desserts and cakes began to appear in the recipe books of the wealthy. But sugar was expensive and only they could afford to use it in large quantities. 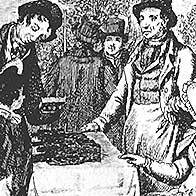 As the price of sugar fell over the 18th century its use spread throughout society, and with it sweetened cakes, desserts and baked goods became more commonplace. Today such is the Scottish 'sweet tooth' that we are encouraged to restrict our intake of these delicious treats. Shortbread has been associated with Scotland for centuries. 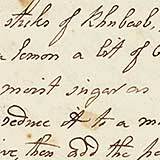 Although we think of it as a sweet treat, the earliest recipes have little or no sugar. 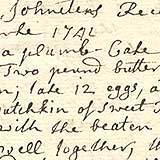 Plumb cakes, made with dried fruits such as raisins or currants, are a feature of many early recipe books. 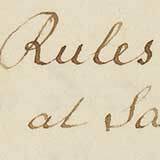 A housekeeper's duties were varied and might include buying provisions, supervising the kitchen and even preparing desserts. 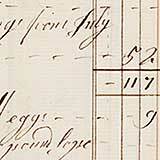 Housekeepers were responsible for a good deal of daily expenditure and were expected to keep detailed records. 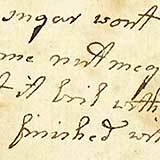 Stephana Malcolm's recipe for boiled 'Mother Eve's Pudding' called for eggs, apples, grated bread crumbs, currants, sugar, salt and nutmeg. 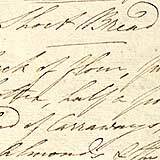 There are several early culinary recipes for rhubarb in Stephana Malcolm's recipe book. Before gelatine was widely available, desserts were set using isinglass, made from fish bladders. 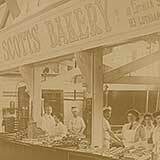 By 1840 when the Scott family's bakery business was founded, sweet cakes, baked goods and confectionery were an established part of the Scottish diet.